1. From the brochure itself: "Originated in 1880 in the laboratories of Henry K. Wampole & Company, Philadelphia, U.S.A., and since continuously manufactured by them, history thus records that WAMPOLE'S PREPARATION is the pioneer -- truly the original and genuine of the tonic preparations of this type." 2. Also from the brochure: The tonic consists of "Extract of Cod Livers, Extract of Malt, Calcium, Iron and Manganese, in readily assimilable form, also Fluidextract of Wild Cherry and other ingredients of tonic value." The Buffalo Medical Journal (Volume 44) of 1888 further details how this tonic was a breakthrough for Wampole's and the medical industry. It gave doctors a better way to administer cod liver oil: "Messrs. Henry K. Wampole & Co., of Philadelphia have well-nigh solved this whole problem in furnishing to the profession a preparation in which the oil is so completely disguised as to taste, odor and appearance, that it can be administered to the most delicate person without producing nausea, or other unpleasant after-symptoms. ... It should not be overlooked by any physician in casting about for a remedy to relieve brain-fag1, headache, and nerve-tire in general." "In a small building on Fourth St., near Arch, was started in the early 70s by the late Henry K. Wampole a druggists' outfitting business of modest proportions, but back of this business was such untiring, indomitable energy that its proportions so rapidly if creased that within a few years the location was successively changed to Vine street, to Market, to Fourth and Arch, to Second and Arch, and eventually to Green street, near Fifth, these changes being the result of always of a demand for larger quarters to accommodate the rapidly developing business. Changes too in the character of the business had been made, the outfitting giving way to a wholesale drug business." 5. Also according to Bottlebooks.com, Albert Koch and Samuel Ross Campbell joined Wampole in the business in early 1878. 6. Business boomed and expanded across the planet. A "large and handsomely equipped laboratory" was opened in Perth, Ontario, in 1905, (nice building picture here) complementing the Philadelphia laboratory. Rideau-info.com adds some details: "In 1905 H.K. 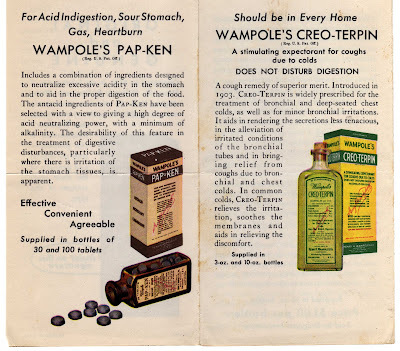 Wampole & Co. built a 4-storey factory to produce a new tasteless extract preparation of cod liver and other pharmaceutical products. The factory was demolished in 1963 when the Company moved to a modem complex on Dufferin Street along #7 Highway." "It’s makers, Henry K. Wampole & Company of Philadelphia, Pennsylvania, claimed it contained malted cereals, beef and milk2. 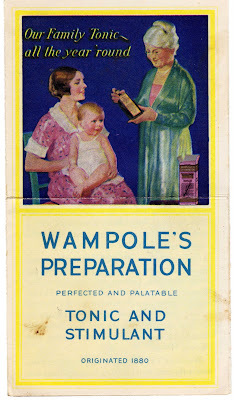 Company advertisements claimed 'There is nothing in it that is not found in mother’s milk; there is nothing in mother’s milk that is not found in Wampole’s Milk Food'. A 1901 medical paper claimed it was the ideal preparation for the nourishment of persons undergoing treatment for opium or morphine addiction. One wonders how big a market that was." "The body of H.K. Wampole, head of the firm of Henry K. Wampole & Co., of Philadelphia, was found floating in the North River off Weehawken on Friday, September 14. On the previous Saturday two physicians started with Mr. Wampole for a sanitarium in the Adirondacks. He had been suffering from a physical breakdown, and it was feared that if he did not get a complete rest his mind would give way. While the three were stopping at a Courtlandt street hotel in New York, Mr. Wampole eluded them and was not seen again by those who knew him utnil [sic] his body was found nearly a week later. His son said that for the past five years it had been evident that his father had been failing mentally. It was thought it was merely a case of overwork, but a long rest seemed to do him no good, so that finally it was deemed best to send him to a sanitarium." Wampole, who had been born in 1849, was survived by his wife, two sons and a daughter. His surviving partners, Koch and Campbell, continued the firm under his name after his death. The company was acquired by the Denver Chemical Mfg. Co. in September 1957. All of his has whetted my appetite for more information about Wampole and his company. 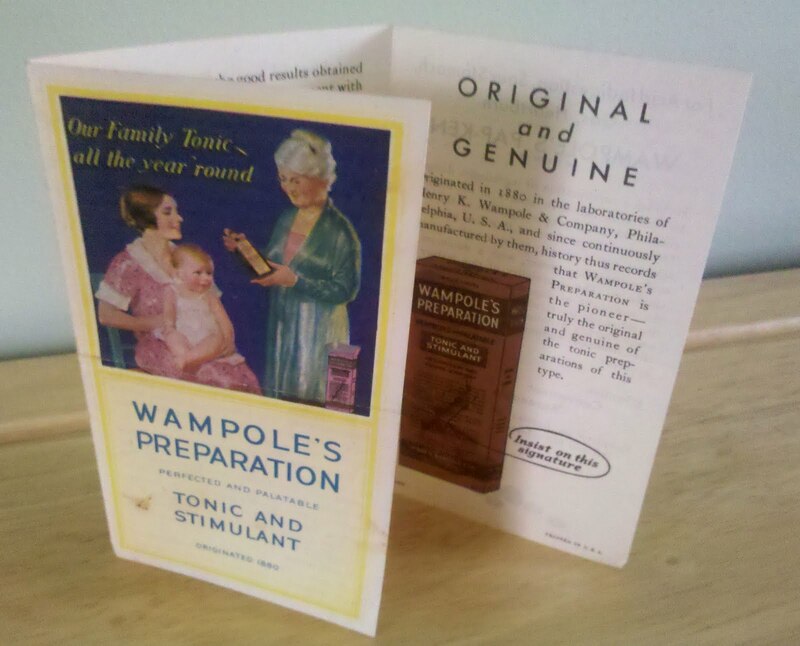 There don't appear to be any books specifically on Wampole & Co., but there is plenty of information and relics floating around online, including information about an intriguing "Virgin Mary" advertisement that I will write about another time. 1. You don't hear that term -- brain-fag -- much these days, do you? It does have its own Wikipedia entry, though. 2. Well, beef and milk do come from the same animal. Actually, here's a fun page that describes "beef tea," "peptonized beef tea" and "milk lemonade." Enjoy. Howdy - it turns out that old Henry had indeed suffered from brain-fag. He had been actively taking his company for a ride. It seems he embezzled a goodly amount estimated at ranging from $200000.00 to as much as $900000.00. According to newspaper articles they never figured out what he did with the money. My fiancé and I found a TON of old glass bottles off a trail in the woods of Oxford, GA this afternoon. We dug about twenty bottles of different shapes, sizes and colors out of piles of dirt and leaves. (you'd have thought we struck gold by our excitement! ) one of these bottles was the typical Wampole & co. Bottle. Thanks for providing information! Your blog has been super helpful! I'm in London Ontario and recently bought a sewing machine and sewing box from a thrift store. Inside I found a Wampole's C-2 Cetyloid-Compound box and went looking for more info (the box says for pain relief). I haven't been able to find anything like it online, but came across your blog looking for Wampole's. Thanks for the great post. I am looking for information about Wampole's methods of procuring herbs for their products. A woman who lived in my area (about 20 miles north of Victoria BC, Canada) from the 1920s to the 1960s and perhaps longer, collected herbs locally for Wampoles, are told. In a rush right now, but will figure out how to contact you later. Ah, how the internet takes us down lanes and paths! I'm putting together a chronology of the architectects Schermerhorn & Phillips in an effort to save a local 1917 school building they designed. In 1906 it appears they designed a factory building for Mr. Wampole... but as you note above, he killed himself. I'm beginning to wonder about these architects.... in 1902 they were designing a house for a Mr. Acuff who suddenly dropped dead due to "paralysis of the heart." Thanks for sharing your Walpole insights! How do u value the paper matter u research ? Thank Q for ur time. I was working on cleaning a house that was destroyed by the March 2nd, 2012 tornados here in east Kentucky and found an old label off of a box of Wampole's but couldn't figure out what it was. Thanks, this was informative and interesting. Any idea what a Henry K Lampole I gallon crock would be worth? I found one while cleaning out our cellar. It is in prime condition. Has anyone gave you a estimate on your crock? I just picked up a 5 gallon one. I love your information. One of my family names is Wampole and they resided in the Philadelphia area. I am currently trying to connect the family history I have to see if he is listed! I had never heard of the company until I bought a 1930's bottle with his Preparation label on it and I bought it for the family name. There is definitely always more to our family stories!!! Thanks again for the history lesson. I also am related to the Wampole name via George W. Wampole. Not sure if or how he was related to Henry Wampole. Also related to Shermerhorn. Interesting how these names were connected in history. We found a bottle from JK Wampole. Any relationship to this company?